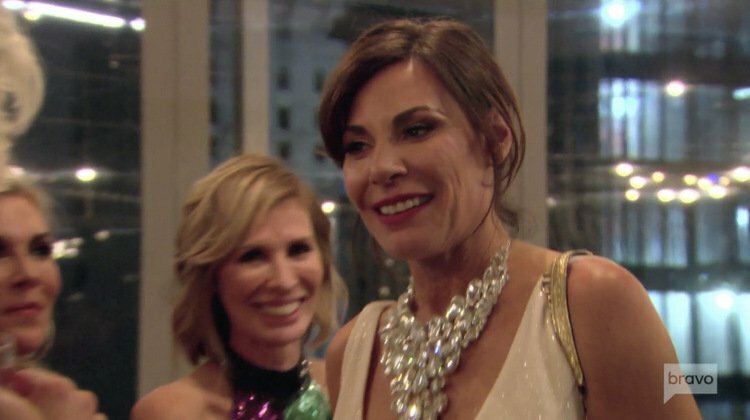 Not even a cheesy cabaret show can mend the broken friendships of this season’s Real Housewives Of New York, but damn if Luann de Lesseps didn’t try! Or, maybe not. Because she didn’t invite Dorinda Medley’s main squeeze to her big show, which created rift #426 between them. Instead of battling with Carole Radziwill again, Bethenny Frankel finds herself at odds with Ramona Singer, who calls Beth out for not supporting women. Or woman, in Ramona’s case. As Bethenny gets her makeup and hair done, she confides in her glam squad about her feelings towards Carole. “I’m in a good place,” she tells random people who aren’t her friends. (Where’s Kevin the driver when you need him?!?) Back at the venue, Luann is happy to see her daughter, Victoria, backstage. And over at her apartment, Tinsley Mortimer and Dorinda share a pre-show drink. Or drinks, as Dorinda’s eventual slurring might indicate. Hmm. Tinsley is shocked to hear that John wasn’t invited to Luann’s show, but Scott was. But I am more shocked to see the enormous swath of blue eyeshadow Dorinda is sporting, making me question what Dorinda did to her glam squad to deserve this look? This is some Erika Jayne level absurdity, but, um…way worse. Dorinda is especially irked because she hooked Luann up with all of her costumes, and she believes she’s been a great friend to her over the years. “John’s been very good to her too,” she says. Luann explains in her interview that of course John was welcome, but Dorinda never asked. So, why is it too late for him to come now, then? Apparently Scott was just invited that day, according to Tinsley. At the show, the group assembles as Luann gets ready for her big moment. Tinsley tells Carole about Scott being invited (but not coming), and Carole agrees that Luann is “not nice.” She also thinks “everyone should know everything!” so she encourages Tinsley to stir the sh*t by delivering this news to Dorinda. The result? Ladies and Gentlemen: Meet Dorinda Medley, Drunken Heckler! Yup, homegirl is SO pissed when she finds out Scott was invited that she spends the entire second half of the show being the worst audience member ever born. It’s slurry, it’s messy, it’s angry. Basically – it’s beyond cringeworthy, whether deserved or not. But the murdery looks and nasty comments Dorinda throws Luann don’t stop Lu from owning the stage and talk-singing through her numbers, as only the goofy Countess can do. Rachel Dratch helps out by bringing the comedy, Tony Yazbeck brings the dancing skills, Bridget Everett brings the comedy, and Andrew Keenan-Bolger shows up to belt out a few tunes blessedly in the right key. Ah, but what does Sonja bring? Well, she brings the cheap stripper! By which I mean, she brings herself. Ramona, god love her, is having a ball and rooting Lu on the whole time, dancing her herky-jerky arse off and doing some version of the Arsenio Hall “whoop whoop whoop!” arm pump. Tinsley gets in on the act when she yells out something about jail, and Sonja, oh Sonja…she does her best to remember her lines and sing the 12 lines of lyrics she memorized before finally untying her wrap dress during “Money Can’t Buy You Class” and giving the audience a full view of the Morgan…Crest? “All my dresses are trained to come off after 11,” smirks Sonja. “That’s how I stay young!” By the end of the show, all of the ladies – with the stark exception of Dorinda – are thrilled for Luann and wish her well. Afterward, everyone gushes about Luann’s performance. Bethenny talks to Sonja about Dorinda’s terrible behavior during the show, and Sonja flat out says that Dorinda “needs to go away like Luann did.” Sonja knows she struggles with drinking too much on occasion herself, but Dorinda’s behavior is next level. At the bar, Bethenny and Carole catch up a bit, even if it’s a tad stilted and weird. At least they’re not in open war anymore, which Bethenny is grateful for. Carole just thinks the conversation is fake and confesses in her interview that it’s too little too late. Ramona busts in to the conversation – which immediately ruffles Bethenny’s feathers – to address her concerns. Bethenny snarks, “Maybe you should call my assistant and make an appointment,” when Ramona defends that she never knows when it’s a good time to talk to Bethenny. OH GAWD. This is going to be painful. 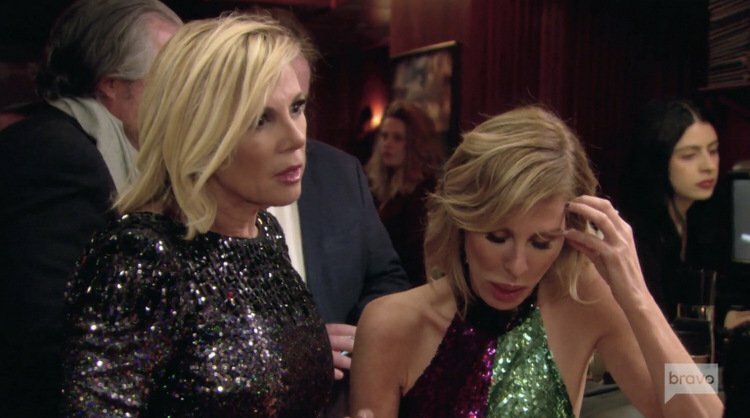 Here’s the rundown: Ramona is hurt that Bethenny didn’t come to her skincare pre-launch party. But instead of offering an apology or even an explanation, Bethenny just tells Ramona she had her reasons. Which she doesn’t plan on explaining to Ramona. Shocked, Ramona’s eyes nearly pop out of her head as she tells Bethenny once again, “YOU DON’T SUPPORT WOMEN! WOW, BETHENNY! WOW!” After stomping off, an unbothered Bethenny just orders another water and turns her back on Ramona. She doesn’t have time for the fake businesses Ramona is a “maven” at, according to her interview. But after Luann arrives, the real drama begins. 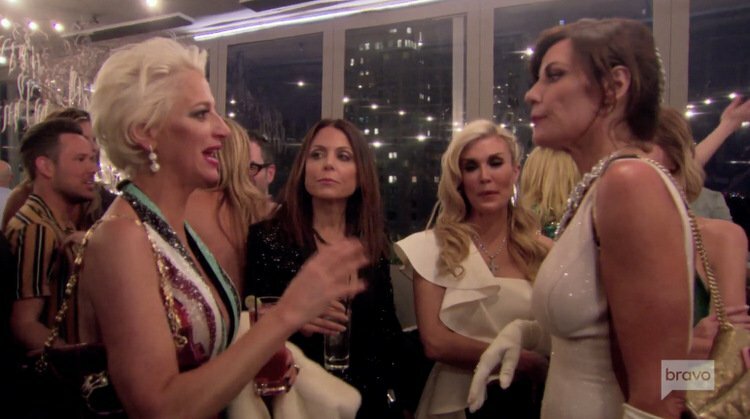 Dorinda, claiming to be “polite and gracious,” circles the group like a land shark at the after party while they all fawn over Luann and congratulate her. Bethenny tries to calm her rage (well, she mostly yells at her about it, then tries to unsuccessfully broker peace between Dorinda and Lu), but Dorinda will not be stopped. So eventually, she puts on her fakest voice and congratulates Luann with a saccharine-sweetness intended to wound. Luann owns a part in this too if she really didn’t invite John, but she doesn’t see it. Or refuses to see it. Or we’re not getting the full story? Luann says John was welcome to come, and she thought Dorinda would buy him a ticket if so. Something tells me it’s probably a combo of all of these “truths” wrapped up in one huge clusterf**k of a situation. In any case, Dorinda is spitting mad at Luann now and makes it known. But Luann doesn’t want her night ruined, so she just shrugs it off as more unnecessary drama when Dorinda finally stomps off and demands another drink. Since Luann won’t be at the reunion to rehash her many issues with Dorinda, this might be the last we hear of it. For now, at least. “See ya, Dorin,” deadpans Luann, who can’t believe Dorinda would act this way on such a huge night for her. “I don’t care about our friendship right now,” says Dorinda in her interview. Sadly, we find out from the finale updates that the two longtime friends are still estranged. Other updates: Ramona is on the prowl for a man and has sold her NYC apartment. Bethenny is still going strong in real estate and disaster relief efforts. (Sadly, we also know that the recent death of Dennis Shields has transpired since filming wrapped.) We also know that Luann, despite ending season 10 on a high note, ended up back in rehab recently after her ex-husband and children sued her. Carole, who won’t be returning to RHONY next season, has supposedly “decided to focus on new projects, less toxic relationships and writing her next chapter.” Okay, Jan. Sonja remains cuckoo for Coco Puffs, but at least she found a renter for her townhouse – at FULL asking price! Meanwhile, Tinsley moved to a smaller hotel suite and continues her on-and-off relationship with Scott. She also continues to torture us with Coupon Cabin commercials, as evidenced by the endless stream of them coming atcha every Wednesday night. Alas, the time has come to say goodbye. So at the end of the party, Tinsley offers Luann a gift and some parting words: “We got arrested in Palm Beach!” she cheers. And that’s the end of RHONY, season 10. Now, on to the Reunion! TELL US: WHAT’S THE REAL STORY WITH JOHN NOT COMING TO LUANN’S SHOW? 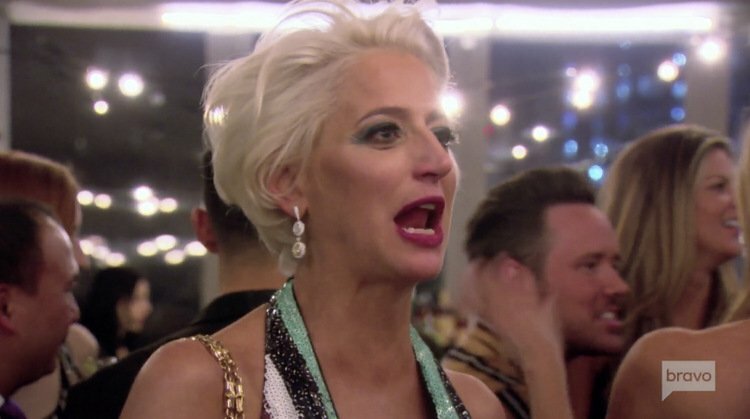 IS DORINDA’S ANGER ABOUT SOMETHING DEEPER? 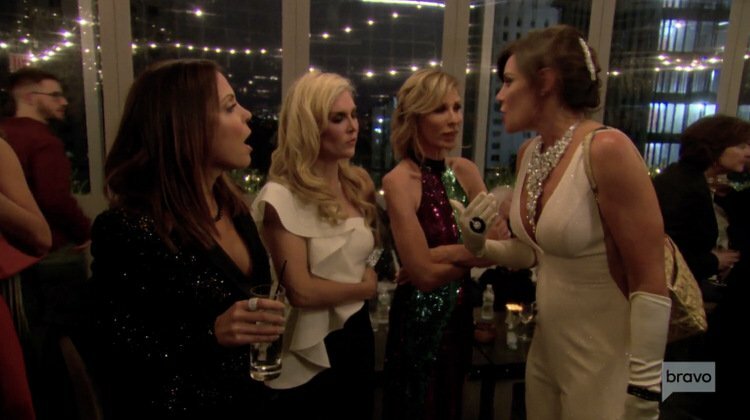 Real Housewives Of Dallas Season 3 Premiere Recap: Feeling The LeeAnne Love!